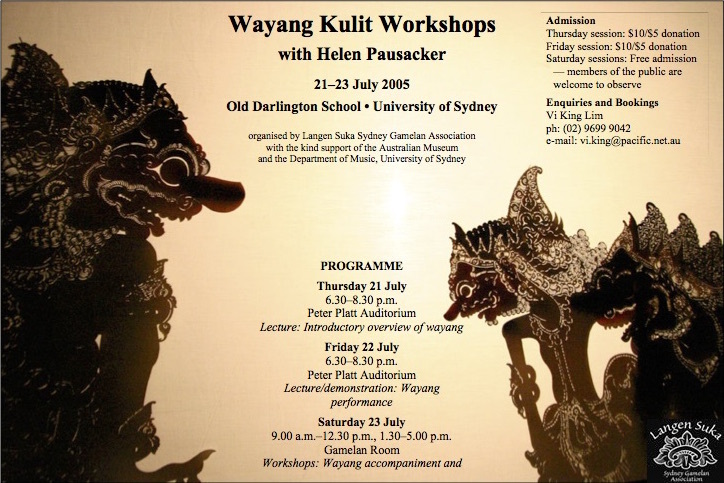 Lectures, demonstrations and practical workshops of Javanese wayang kulit puppetry and gamelan accompaniment by Melbourne-based dhalang Helen Pausacker. Introduction to dodogan — how the dhalang calls for sampak, using knocks on the puppet chest (dodogan), how the music is sped up and how it stops. Practice with these dodogan, with musicians taking turns to practise the dodogan, as well as play the music. Explanation of the dodogan used for srepegan. Practice with these dodogan. Explanation of the dodogan used for ayak-ayakan. Practice with these dodogan. How does a dhalang call for particular gendhing, so the musicians know what to play? How do the musicians know when to be quiet, while the dhalang speaks (sirep)? Which instruments play during this period? How does the kendhang accompany the movements of the puppets? Practice with these dodogan, using example of Asmaradana.